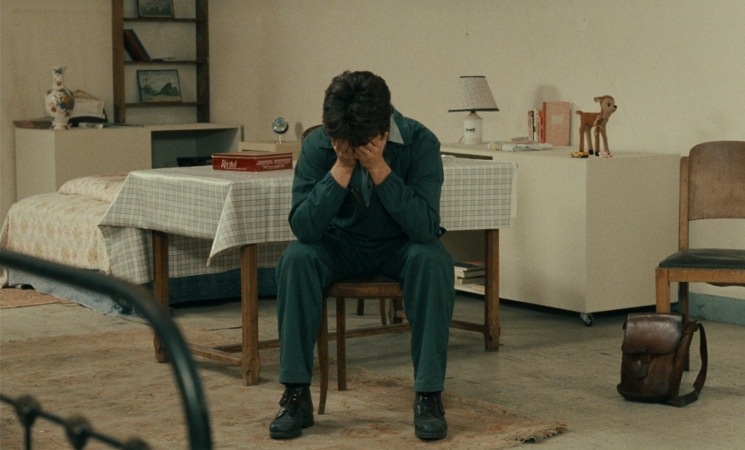 Robert Bresson's final film L'argent (1983) is one I wouldn't blame first-time viewers for hating, as some movies just take a while to warm up to. (Spoiler alert: I've seen it several times, and it still leaves me cold.) 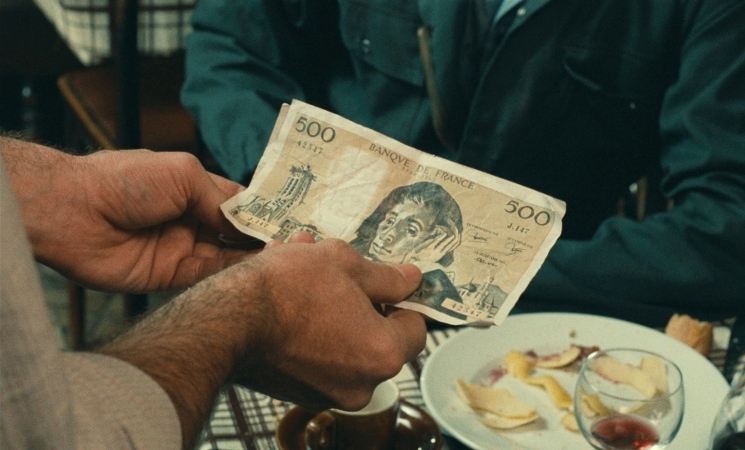 Essentially, we follow the journey of a counterfeit 500-franc note as it's passed between several owners: spoiled young Norbert (Marc Ernest Fourneau), unsuspecting camera shop owners (Béatrice Tabourin and Didier Baussy), their thieving employee Lucien (Vincent Risterucci), and finally, hapless truck driver Yvon Targe (Christian Patey), who gets the forged bill after delivering a tanker of oil to the shop owners. It's a short trip, all things considered, and when it's over we're all but blindsided by an increasingly brutal chain of events: from there on out, let's just say that things don't end well for Yvon or just about anyone who crosses his path. Several immediate red flags are raised by the characters and their interactions; very few folks are worth rooting for, and the ones who are get utterly dismantled by L'argent's morally reprehensible subjects. Everyone seems to be out for their own interests, with very few exceptions. Norbert just wants easy money. The camera shop owners are eager to pass off the note---"Paris is full of them", one says---to avoid a loss. Lucien, sensing his bosses' dishonesty, outright lies to police about Yvon's delivery and uses a price-swapping scheme to pocket extra francs when he's got the store to himself. Yvon is confronted at a restaurant for paying with the same note, police are called after he assaults a waiter, and he gets caught during a robbery after losing his job, so Yvon's poor wife Elise (Caroline Lang) and young daughter might be living alone for the next few years. Yvon's moral compass is gone, and L'argent's weak reasoning implies that a counterfeit note's existence is the culprit. As the film wears on, his total lack of humanity approaches a fever pitch and, upon his release from prison, Yvon attempts to commit unspeakable crimes for reasons only he can justify. The short distance between "family man" and "cold-blooded killer" during L'argent is, on the surface, almost laughable. By focusing so closely on a group of like-minded, selfish individuals and painting with such broad strokes, Bresson's film ultimately says little in its condemnation of humanity. It suggests that one selfish act has the potential to destroy multiple lives, a sentiment much easier to stomach when treated with more care. 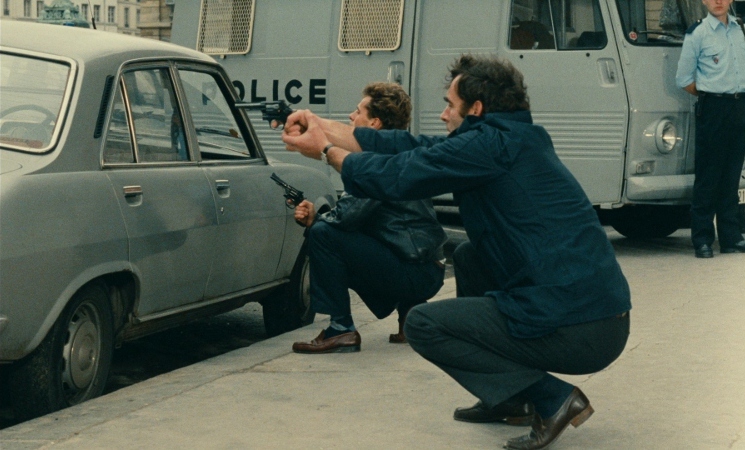 As it stands, the marriage of such a heavy-handed story with Bresson's cold, calculating visual style is simply not a good fit: L'argent is a fatally distant and cynical affair, aiming closely at its intended target with the wrong gun. Another bad fit? Bresson's trademark use of "non-actors", as most have mannequin-like delivery (none more so than Christian Patey) and thus are nearly impossible to sympathize with. Though not completely lacking emotion at times, Yvon's robotic transformation following his prison stay just doesn't feel convincing at all. Nor does his wife Elise's sudden departure following their stilted final conversation through a glass window---not surprising, as Bresson admits hiring Caroline Lang just for her face during an accompanying Q&A. While I'm certainly not against the use of non-actors altogether (in Bresson films or otherwise), they simply don't gel inside such a cold and entirely cynical story that seems to hold its viewers at arm's length. 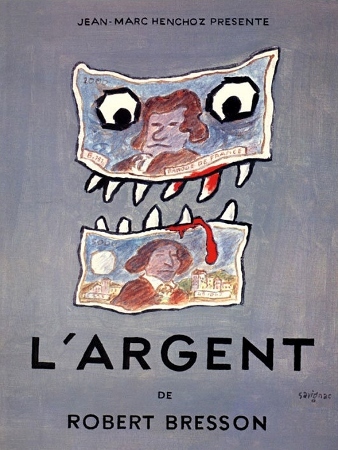 Ignoring its blame of the wrong culprit (much like those who misquote "the love of money is the root of all evil" by omitting the first three words) and its lack of convincing emotional performances, does L'argent have anything working in its favor? Bresson's economic visual style has rarely been in better form, as the tight editing and audacious cuts away from on-screen action obviously show his full command of a visual medium. The camera rarely moves, usually relying on carefully-framed static shots that offer subtle clues you might not catch the first time around. It's perhaps the film's only saving grace and makes L'argent watching at least once: even if you're as continuously turned off by the story and characters as I've been several times, it offers an outstanding example of visual quality over quantity that, quite frankly, I wish was employed more often in films. In short, L'argent presents an extremely off-putting story that's told with machine-like visual precision, and I'm still not convinced it lies anywhere near the top of Bresson's output. Nor is Criterion's new Blu-ray one of their better efforts: the A/V presentation is quite impressive, as they're working with a recent 2K restoration, but the relatively weak bonus features will likely not change your mind about the film if you're sitting on the fence. For all but L'argent's most established fans, this is the perfect example of "try before you buy". 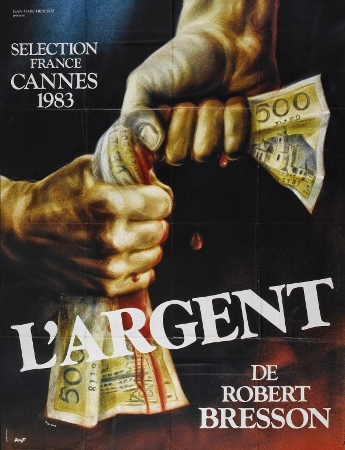 Not surprisingly, this new 1080p transfer of L'argent, sourced from a new 4K scan of MK2's recent 2K restoration, is an eye-catching presentation that will certainly impress first-time viewers or those who haven't seen it in a decade or more. 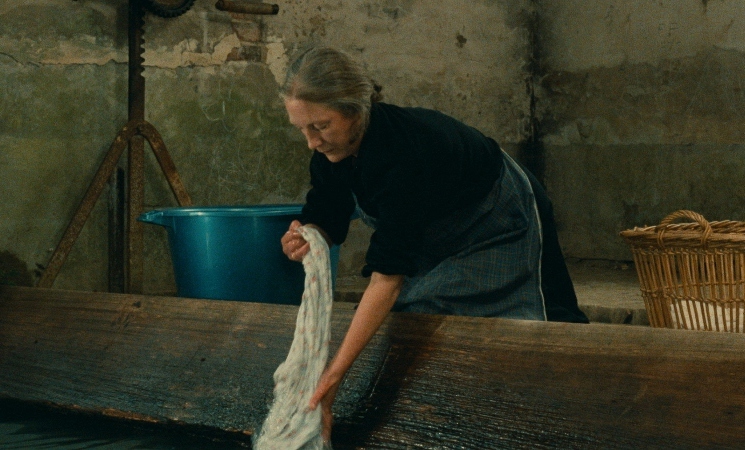 Grain is very refined and rich in all the right ways, the film's very specific greenish-blue and cream color palette---with notable bursts of red, mind you---is replicated perfectly, and image detail is extremely robust during close-ups and mid-range shots. Black levels, texture, and contrast maintain the film's purposefully flat appearance, and everything works together to give L'argent a distinct and smooth (but not overly processed) appearance. Bottom line: Criterion's Blu-ray looks fantastic and it's great that such a visually stylish production got the extra spit and polish. Though New Yorker Video's 2005 DVD received fairly solid marks in DVD Savant's review, it's obvious that this Blu-ray stands head and shoulders above that disc. Less obvious but still appreciated is the linear PCM 1.0 mix (French), which replicates the quiet-loud dynamics of L'argent's more chaotic scenes and its insular, dialogue-driven moments. There's a modest amount of depth at times, but this is largely a down-to-earth audio mix that rarely steps outside genre boundaries. Optional English subtitles are included during the film and bonus features for translation purposes only. As usual, Criterion's menu is smooth and easy to navigate. The disc is locked for Region A players only; it's packaged in Criterion's stocky keepcase with attractive cover artwork. The Booklet includes an essay by critic Adrian Martin and a newly expanded 1983 interview with director Robert Bresson by critic Michel Ciment. Less than expected, and I'll be honest in my disappointment with what we get here. A 1983 Cannes Film Festival Press Conference (30:26) features Bresson and members of the cast, but quickly develops a hostile tone and plays out like a train wreck. Bresson is very defensive and mostly blurts out non-answers (even to those who seemingly liked the film), usually insulting audience members in the process...but to be fair, a lot of the questions aren't all that great. Exacerbating the confusion is a moderator/translator, who fights for attention while he and the director speak over one another constantly. The cast mainly just sits there. One gets the sense that Bresson and company were roped into this, and the poor planning and format only make it worse. Ironically, it mirrors my opinion of the film itself: a frustrating and joyless experience, but far from boring. "L'argent, A to Z" (50:48) is a new video appreciation by film scholar James Quandt, who takes an alphabetical approach ("Anachronism", "Biography", "Color", etc.) in his analysis of the film and Bresson's career as a director. The effort is appreciated as there are several interesting connections made...but as a whole, the format seemed gimmicky this time around as a handful of observations are stretched to fit inside its boundaries. I'd have much preferred a straight commentary, and one that didn't seem so fawning at times. Lastly, we get the film's short and sweet Trailer (0:27), which was made from several brief shots not seen during the final cut. Mentioned earlier, New Yorker Video's 2005 DVD also included a feature-length Kent Jones commentary and two Bresson interviews that do not appear here. Though Criterion is usually consistent at licensing older supplements, these are three notable exceptions that will likely give fans good reason to keep both discs. Bresson's long, sporadic, and ultimately fruitful directing career has produced no shortage of singular classics (A Man Escaped, Pickpocket, Au hasard Balthazar) and very few misfires (Lancelot du lac), yet his final film L'argent feels like a rough landing. Brutally pessimistic, the film has a deep roster of self-absorbed catalysts that seems to swallow up anyone with a moral compass. It's thoroughly unpleasant at times, which makes its status as "final film from a celebrated and influential director" all the more tough to swallow. Perhaps its only obvious saving grace is Bresson's efficient and calculated visual framing: L'argent brazenly cuts away from important events, repeating careful visual clues to help us fill in some of the blanks. Criterion's new Blu-ray pairs a sterling A/V presentation with a surprisingly weak collection of extras, none of which changed my overall opinion of the film. Rent It, although long-time fans may find enough here to justify a purchase.